Pom Pom plant proves popular! Jacarandas are in bloom around Macarthur. The photo above was taken in Johannesburg in South Africa. Apparently Jacarandas arrived just after gold was discovered. As the City expanded Jacaranda trees were planted as street trees. The trees provide shade from the hot sun and they bloom like this every November. 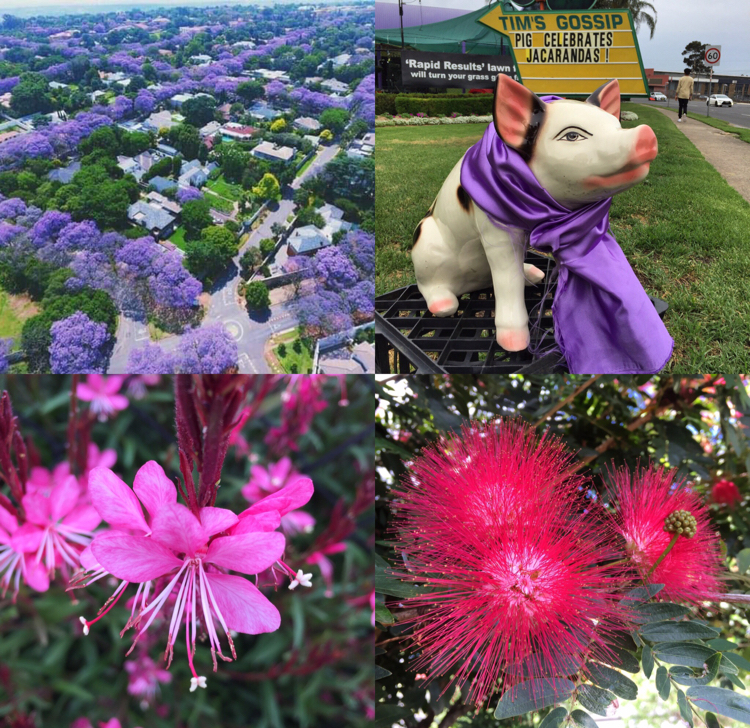 Jacaranda trees grow well in Macarthur, so it just makes sense that we should plant more. If you have a bare, treeless nature strip, plant a Jacaranda tree. It will shade your car from the hot sun all summer long. It will cool the air around your house too. In November it will be covered in mauve blooms, leading up to Christmas. My son Dan has had a fascination with Jacaranda trees since he was a little boy. He would bring seed pods home in his pockets, he collected rocks too. Then he started finding Jacaranda seedlings popping up in gardens. These got potted up until he had over 100. We decided to sell these rescued plants for $5.00 at the nursery. They were a huge success. Recently Dan has grown them from seed. They are much more uniform plants when grown from seed with straighter trunks. We have almost 200 trees ready to sell now at the nursery today. For best results plant your tree on a mound of IGC Planting Compost Improved soil. Mulch around the base with Tim’s Termite Resistant Mulch. Water twice weekly with a bucket of water. If you don’t have room, plant one in a local park or school. Eventually Dan hopes to turn Macarthur mauve in Mauvember. Imagine if we end up looking like Johannesburg. We have a Pom Pom tree growing in our nursery carpark. It’s Latin name is Calliandra. This fast growing small tree has these Pom Pom like, red flowers, all year round. It’s amazing!!!!! Calliandra looks like a native plant, and it does attract nectar feeding birds into your garden. It can be pruned to any size and it could even be planted as a hedge. It will quickly give you privacy from your neighbours and you will love the flowers. We have nice potted plants in the nursery today from just $24.99. They are already in bud and ready to flower! We have beautiful Fuchsias this week. These old fashioned flowering plants have flowers that look like ballerinas. They can be grown in pots, hanging baskets and gardens. They like morning sun then shade. We have nice big plants covered in buds and blooms for just $16.99. They make great potted gifts. We gift wrap for free! If you haven’t been to our nursery recently you won’t know how amazing our shop is looking. We have beautiful indoor plants and a huge range of ceramic pots. With Christmas coming, indoor plants make inexpensive gifts. They are in fashion big time. Kids love them too. They also clean toxins from the air inside your house. How amazing is that? Gauras are busting into bloom. Often called Butterfly plant, because when the flowers whirl in the wind they look like Butterflies. Camden Council has planted these in Argyle Street in Camden and they look amazing. They come in white, pink and dark pink. They grow one metre high and flower all summer and autumn long. If they ever look untidy simply prune back by 50% and fertilise with Tim’s Fast Food. They will flower again within weeks. Christmas is only 6 weeks away. There’s still time to have your garden looking amazing on Christmas Day. Come talk to our Horticulturists. Fresh Cut Christmas trees arriving first Saturday in December.